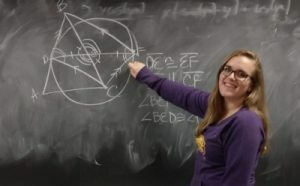 Jaclyn Miller, who was awarded an Iowa Space Grant Consortium STEM Education Scholarship at the University of Northern Iowa, has been featured in the school’s STEM Stories on their STEM web site. She’s a junior majoring in mathematics education. Read about her love of math and about her UNI experience, aided by her ISGC scholarship, here. To access that story and similar ones, see the STEM Beat page on the UNI web site here.